They came in the dead of night when our guard had slipped for just a second. It was a classic pincer movement that any panzer division would have been proud of. Four in total, two closing in from each end of the Land Rover, using darkness for cover; we stood no chance and were overrun in a matter of seconds. Megan saw them first but didn’t get a chance to warn me and they were within the camp boundaries before we could react and stage a defensive counter strike. Kittens, kittens came and won our hearts and minds before we knew what was going on. Megan actually fell in love a little bit and spent a lot of time with the kittens, in fact she spent pretty much all her waking time with them and it was truly very hard to drag her to the beach! I know, can you believe it, we drive 100’s of miles so she can play with cats?!? They were damn cute though, and even I, the world’s greatest cat hater, found myself stroking, playing and picking up the bloody things. We even spent money out of our very small daily budget on cat food, cat food! Unbelievable. Other than the furry balls of fun there aren’t a lot of things to write about during our week long stay at camping Sika: got up, went to the beach, came back, cooked some dinner, read, and went to bed. A brilliant, brilliant week. All good things come to an end though and it was after much effort that we managed to pull ourselves away from the world’s best campsite and started towards the Turkish border. It would take a couple of days to get there so after all day driving we started to look for a campsite and finally stumbled across Camping Paradiso. I’m glad to report that the Greeks have a sense of irony. Paradise it was not. No lights in the toilets, use your own imagination at the state of the men’s toilet floor. No lights in the showers- showering in the dark was a new and disturbing experience. No hot water, why would there be?! No lights on the campsite at all now I come to think about it. A washing machine that held our clothes hostage for 3 hours. Toilets that were truly, truly awful. The smell!! My god, still so many nightmares. Anyway, nasty campsite apart we had a really enjoyable time in Greece and as I have said a number of times it was a real struggle to move on from Europe, but Asia and Turkey beckoned so with a little apprehension we headed off towards our first real border crossing. Now where are those passports…..? OK sorry about that, I feel better now so moving on the Athens. It’s funny how sub prime mortgages in the US, quantitative easing and the global recession thwarted our first attempts to get to Athens. We turned up nice and early after getting up at ridiculous o’clock and driving the winding road to the station, which was about 30km from Athens itself, only to be told that there was a strike on and there would be ‘no trains today my friend’. Doh. After all our previous parking issues we had decided that driving into the third largest urban mass in Europe (I know, right? we were surprised to read that too!) would not be a good idea, so we went away muttering that this kind of thing would never happen in England, conveniently forgetting that it actually happens all the time, and sat on the beach to sulk. A hard life indeed. Trains back on and the strike ended by everyone apologizing, hugging and shaking hands (I’d like to think), we caught the train into down town Athens. 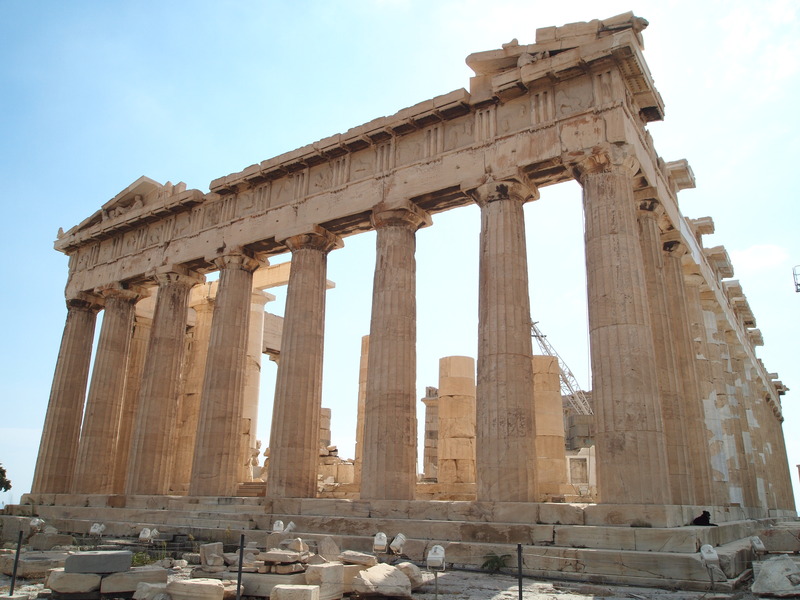 We didn’t really know what to expect from the Greek capital but we were both blown away by the food markets, the Acropolis and the Parthenon. What an amazing view from the top of the Acropolis; the sweat patches and mild heat stroke were well worth the climb to get to the top, and we tagged on to a Japanese guided tour around. Now we don’t speak Japanese but we think we got the jist- it was built by the Vikings right…? We somehow managed to drag ourselves away from the beach and drove on a further 4 hours towards Istanbul. 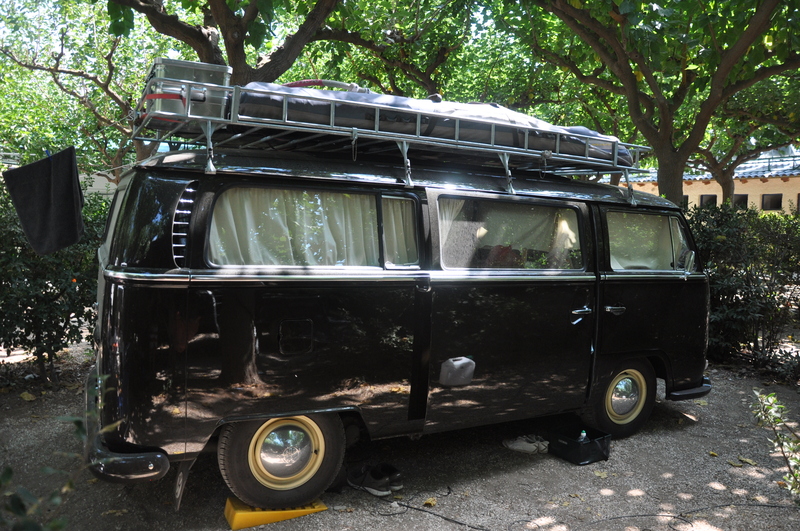 We had been told about an amazing campsite near a place called Volos from our new found Swiss friends and decided to check it out. We arrived to actually find the best campsite known to man and it goes straight in at number one top five all time best campsites. Our pitch, and where I am typing this now, is on the edge of a 10 metre cliff looking down onto a deserted beach and a tiny little fishing village. Postcard perfect, in fact I’m going to have a job trying to drag my co driver away from here, and the phrase “squat toilets are used throughout Turkey” that we read today in the Lonely Planet will do little to help the cause. 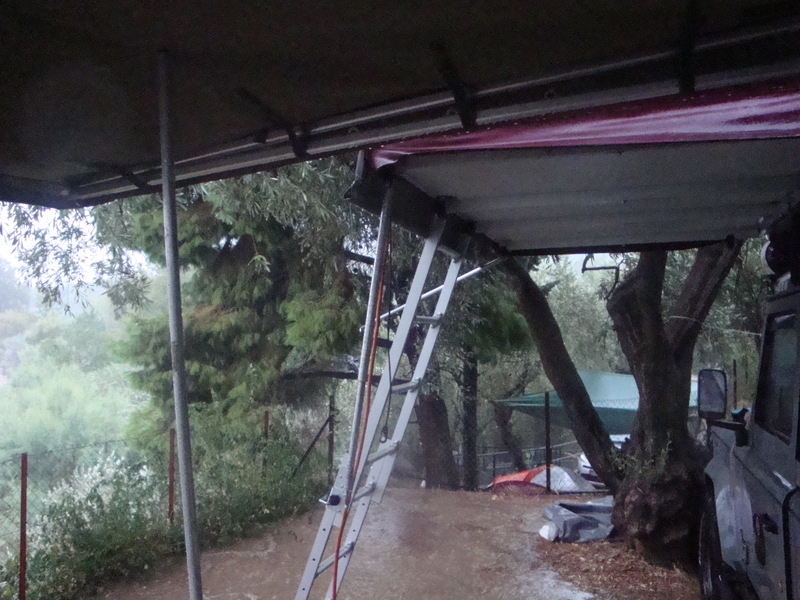 Things weren’t all peaches and cream however, on our first night here the rain that continues to haunt us from Italy struck back with a vengeance. Man what a storm, hopefully the photo below will show you the extent of the downpour. Within minutes of the rain starting a river of Amazon proportions started flowing under the car and over the cliff. Megan’s comment that perhaps we might be washed over the edge was strongly rebuffed but secretly I was thinking the same thing but could not be bothered to survey the situation, as getting out of the tent would mean taking a fully clothed shower. Needless to say we didn’t get washed away and spent the evening playing dominoes in the tent whilst the thunder, lighting and rain did its best to interrupt our nail biting game. We later learnt that it was the first rain they have had since June, classic Maple luck. Ah but I hear to ask, if it rained, surely the car must have leaked? How wrong you all are, how dare you suggest such a thing! All my stuff stayed 100% dry, mainly because it was behind Megan’s clothes, which didn’t. They were actually washed by the rain, which I thought was ideal as we didn’t have to pay for a washing machine and to be honest Megan had started to smell, two birds one stone! She however didn’t see it my way, so after using every available bit of string we had and hanging up Megan’s entire wardrobe I did battle with my arch foe, silicone sealant, and attempted to plug the gaps. Stay tuned so see if it will work……. Just on a side note, it’s been really nice once again to get messages from family and friends and people who have come across the blog, as well as those who have read the article in LRO. We will do our best to reply to everybody as soon as possible, but whilst the internet costs €4 a minute the potential costs involved in sending these replies would result in our budget getting us no further than the Turkish border! In this exciting installment we learn that Megan really hates mountain roads, I mean really hates them, gravity goes two nil up, and we are no longer the coolest campers on the campsite…. The last full day in Italy was spent visiting the Amalfi Coast. The book quoted this as the ‘most beautiful stretch of coast in Europe’ so how could we not go? and there was something about Megan’s family coming from here, but I forget the story even though she claims she has told me hundreds of times. Our reliance on the GPS was, at the time, total so we put in the name of one of the small towns on the coast and off we went. Ummm, well the town was 9 miles away but it took us about an hour and a half to get there. Mr GPS thought we would enjoy a trip through down town Pompeii first, an area that for Italy seems to have no discernable traffic regulations, save that everyone absolutely must overtake everyone else in the narrow, over crowded streets even though there is a constant traffic jam in either direction. After the stress of that he thought he would give us a break from the hustle and bustle of the town and show us the seaside not through the tunnel, oh no, tunnels are for chumps, but over the steepest hill the poor old Land Rover has ever seen, and judging by the black smoke coming out the back it wasn’t happy about it. The Land Rover wasn’t the only one, Miss Cartwright it seems is not a fan of twisting, narrow, steep, edge of the cliff driving in a 4 tonne Land Rover where the steering wheel only really acts as a suggestion to the wheels its meant to control. 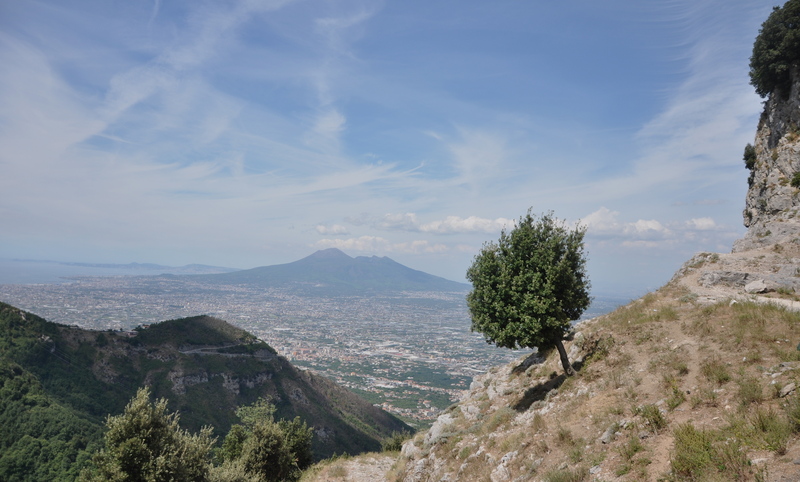 However we were rewarded with the most awesome views for the Mt Vesuvius and the valley below. Once the temperature gauge in the Land Rover had gone from molten lava to gentle simmer we headed down the other side and eventually arrived at the town of Ravello. From Ravello we followed the coast road/cliff edge back to Sorrento and Pompeii. Again, this is a most interesting road to navigate with a large car although by the end of the day I was hand braking the car around the bends like a seasoned Italian. We packed up the camp, a task that we now have down to 47mins from the 2 hrs in France, and headed toward Brindisi and the ferry to Greece. The idea was to take our time, as the ferry was not until 9pm so a few interesting stop offs where highlighted in the Lonely Planet and we set off in good cheer and high sprits. That quickly changed as the heavens opened and the most torrential down pour this blogger has ever driven through proceeded to last the entire width of Italy. In true Land Rover form, the two front doors, pedals, and air vents let in so much rain that tea towels, toilet roll and t-shirts were called into action to stem the flow of water into the cab. Every so often we had to stop in order to drain the water out of the foot wells, as the level was in danger of reaching ankle height. It was a strange sensation to drive whilst getting a foot spa and progress was slow to say the least. Bends didn’t help; as the Land Rover rolled a shriek from the passenger seat indicated that water had found a new entry point and had managed to land on Megan, which although mildly amusing was hardly the way one would choose to spend 6 hours crossing Italy. She was in constant fear that the next corner would result in 4 litres of water pouring onto her lap! We finally got to the port with no stops except for de-ballasting operations, at 6 pm. Seeing that I have worked on ferries for the last 3 years (I was a captain, no no really, I was, you can ask my mum) I had a professional interest in the Greek ferry operation, and I know I’m speaking to a limited audience with the following observations, which were totally lost on Megan, but to those reading this from Irish Ferries, I’m sure you will be tremendously interested….or maybe it’s just me. Actually, I’m not going to list them all because it makes me seem a little sad that even on holiday I go around looking for safety violations on ferries I don’t even work on. However, my personal favourite was a fire door wedged open with expanding foam, so I’m sure you get the picture. Needless to say, I wore my life jacket all the way across, slept in the lifeboat and held a flare in each hand. Oh and I fell down metal stairs and again landed on my back, you win again gravity. (Hot, oily, greasy Greek road) + Rain = A road surface equating to glass. To be honest, I was rather impressed that we had managed to get a 4 tonne Defender 130 to go sideways, Megan however, wasn’t and from then on a snail’s pace was demanded from the Head Chef until we got to a better road. We witnessed a few recent accidents where cars with lesser drivers than myself had failed to stop in time, and ditches and fields became the last resting place for many a car that day. An up side of this very slow progress was that we achieved an extra 50 miles to a tank a fuel, which was nice. 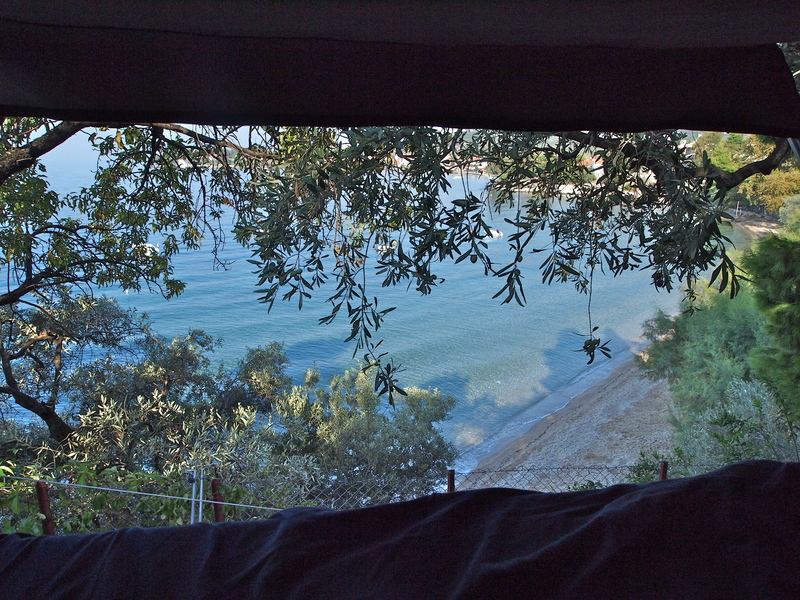 We finally found the Campsite recommended in the Rough Guide (which incidentally is nowhere near as good as Lonely Planet Guides) near Athens, and once the man was paid and our pitch found we ran into the sea and let out a rather big ahhhhhhhhhhhhh! Evening: Applied copious amounts of after sun. Afternoon: Sat under the umbrella. Evening: Applied slightly less after sun. Braved the sun again, with varying shades of pink achieved.